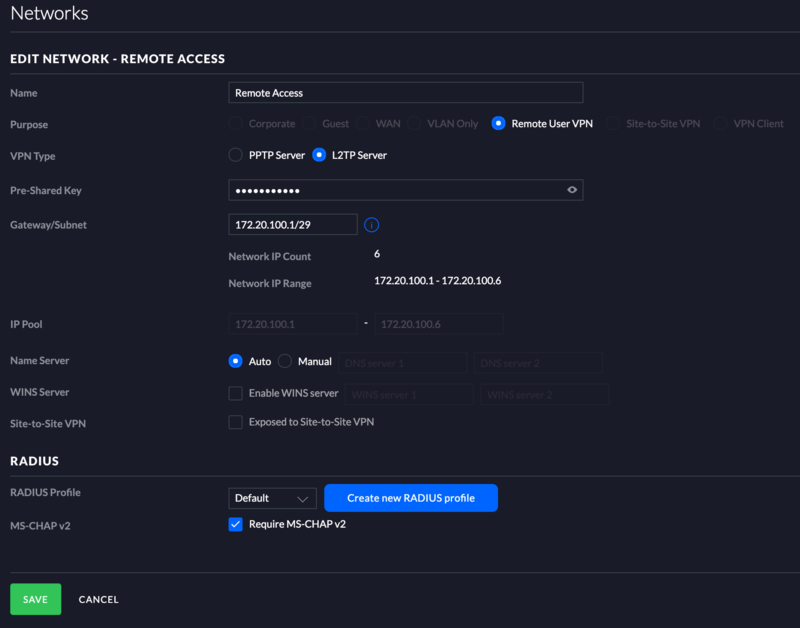 This article describes how to set up an L2TP VPN using the UniFi Security Gateway (USG) as a RADIUS Server. L2TP VPN is designed to only work on WAN 1. Please complete the prerequisite configuration found in the UniFi - USG: Configuring RADIUS Server article before following this guide's instructions. 1. Navigate to Settings > Networks > Create New Network in the UniFi Controller. Nameserver and WINS servers: Can be left auto/blank, unless further customizing the configuration is desired. 3. Choose the Default RADIUS Profile from the drop-down. Right-click the L2TP adapter, then go to Properties > Security. If your USG's WAN is behind NAT and has a private IP, it is necessary to configure port forwarding on the upstream router to forward UDP ports 500, 1701, and 4500 to the USG's WAN address.